The Fraternity of Ancient Free and Accepted Masons is the oldest,largest and most widely known fraternal organization in the world. Volumes have been written about it. Yet, to many, Freemasonry remains a mystery. Some historians trace Freemasonry to the Tenth Century, B.C., during the building of King Soloman's Temple. Records reveal that Freemasonry was introduced into England in 674 A.D. Freemasonry traces its ancestry to the operative craftsmen, primarily cathedral builders, of the Middle Ages. These men, because of their special knowledge and skills, were permitted special travel privileges from country to country. They developed means of recognition and identification of their work. In the 17th Century, when cathedral building was on the decline, many guilds of stonemasons, known as ''Operative Masons'' or ''Free Masons'', started to accept members those who were not members of the Masons' Craft, calling them ''Speculative Masons'' or ''Accepted Masons''. It was from these groups, comprised of ''Adopted or Accepted Masons,'' That Symbolic Masonry or Freemasonry, as we know it today, had its beginnings. 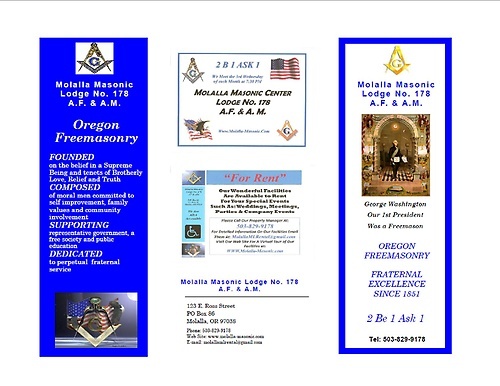 Molalla Lodge #178 A.F.& A.M. is a group of men that meet today to in an attempt to become better men. Our Lodge building is located at 123 E. Ross Street, near city hall, and the Molalla Police station. We hold our business meeting on the 3rd Wednesday of each month at 7:30 pm. Visiting brethren are always welcome. We gather most Wednesday evenings about 7.